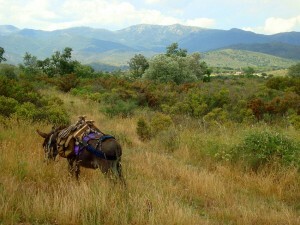 In addition to guided and organized tours, we also offer the opportunity to rent donkeys for hiking and trekking. Our experienced donkeys accompany you so on your own personal tour, either with your family, with friends or traveling alone with a donkey. Of course, we provide advice on route planning and are available for advices and help if needed on the road. 1. Check the availability of the donkeys and make a reservation by info@burrotrek.com or 0034/633 576 272. Tell us the way do you want to go, the date (from … to …), and the number of donkeys you want to take on the hike. 3. After you get the booking confirmation of the accommodation, make the definite booking for the donkey/s completing the reservation form. Please tell us when and where you will stay. * 30% of the donkey rent is to be payd in advance for the Reservation. The balance must be paid before departure by donkey in cash or by bank transfer to burrotrek. * If you wish that we organize the accommodation, that’s no problem, but we have to charge an administration fee and Taxes. Normally accommodations have to be paid in cash after arriving there. For longer trips, please request the price. If you want to do a longer tour or you want to be on the road in another hiking area and a transport of the donkey is necessary, it’s no problem. We will pick you up or take you to where you want to do the route. Price per km 85 cts.